The bedroom, according to Thai culture, is a private place. It is a place into which you do not normally invite others, whether they be strangers or even friends. But I am going against convention and inviting you into my bedroom because I have a story to tell about my quest to silence a squeaky bed. 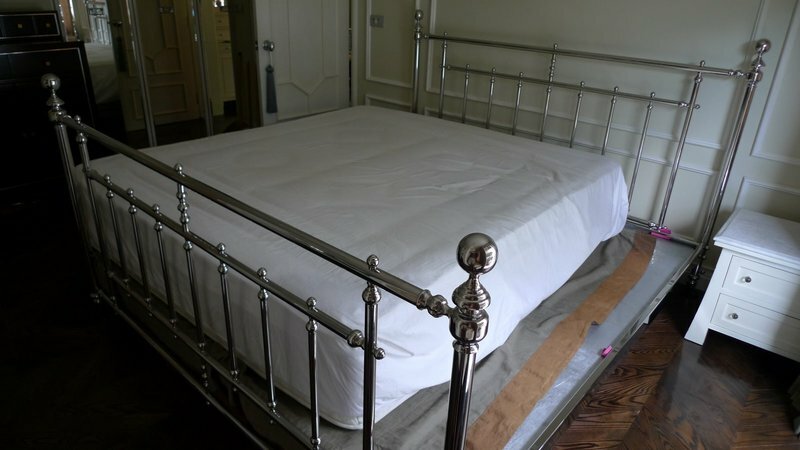 A local metal worker made the bed frame we have used since moving into this condo more than three years ago. It has all the stylings of an expensive Martha Stewart Living frame (upon which the design was loosely based) at a fraction of the cost. But in the past year or so, the bed frame has started to make noise. Cue the obvious jokes and smart-alec comments. Somewhat ironically, it doesn’t make any noise from those sorts of activities. In fact, it only makes noise when you turn over and, even then, only intermittently. 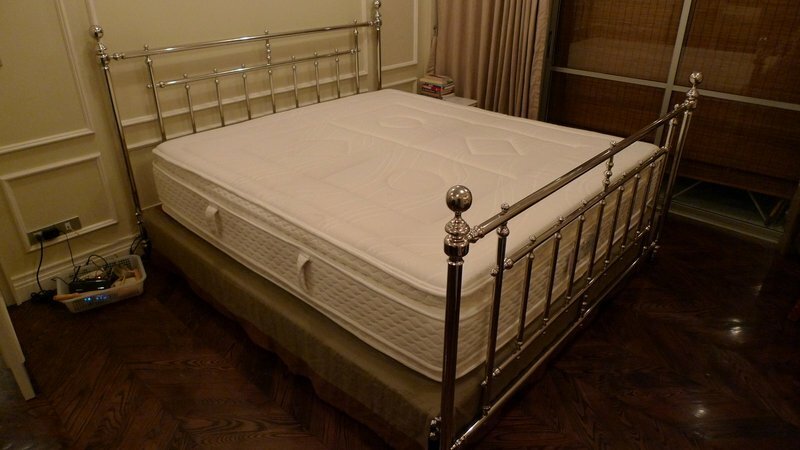 The noise isn’t the full-throated “squeak, squeak” of mattress springs. Instead, it is a subtle but high-pitch chirp that echoes through the frame and is at just the right volume and frequency to momentarily wake you up, producing something like an auditory sleep apnea. We tried many things to troubleshoot the problem. For example we cut up an old yoga mat and used it to cushion every point at which the frame came into contact with anything else. We tightened all the screws and connections. 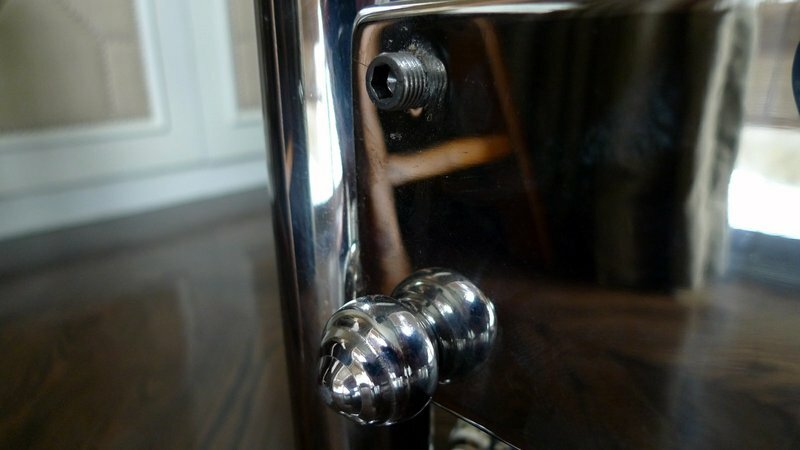 Initially, we didn’t realize that the frame was held together with hex key screws and were just tightening the decorative knobs. When that didn’t work, Tawn had the makers of the bed frame come out and they revealed the hidden screws, tightening all of them. That lessened, but did not eliminate, the chirp. Notice the little bits of pink yoga mat cushioning the frame. Working our way through the problem solving process, we turned our attention to the board under the mattress. Ever since moving out of my parents’ home decades ago, I’ve never had box springs, not seeing the point of them. But I started to rethink the wisdom of living without box springs because every twist and turn of our bodies was being transferred to the frame, which would in turn protest with that shrill, sleep-interrupting chirp. 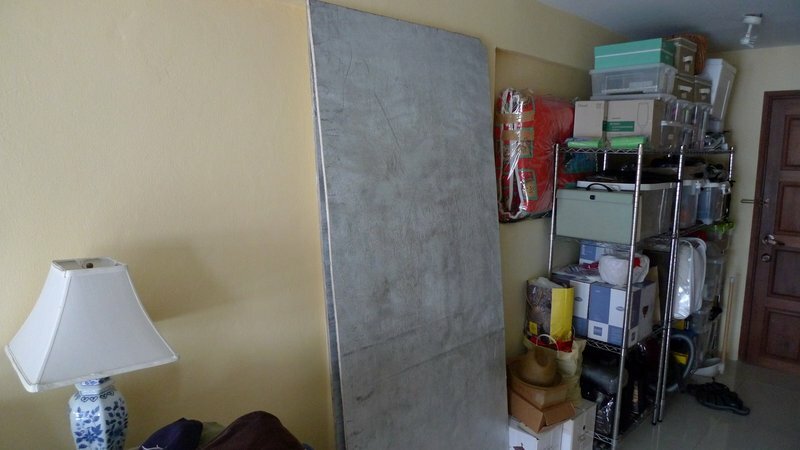 The next-to-final solution was to purchase two box springs to replace the boards and transfer the full weight of the mattress to the floor rather than to the bed frame. Workers from the department store came and measured to ensure the box springs would fit inside the frame. We placed an order and last night, some six hours after the scheduled appointment, the delivery men arrived and installed the box springs. The fit is good and the box springs are only about an inch higher than the boards on which the mattress previously sat. Tossing and turning to test them, we could not induce a single chirp from the bed frame. The first problem is that the frame, which no longer has any lateral support, shifts easily. This means you cannot sit up in bed, resting against the headboard to read a book. The second problem is that there is no longer any under-bed storage now that there are two box springs taking up what was once free space. The final problem is trying to figure out what to do with the two large plywood boards. Any takers? This entry was posted in Uncategorized and tagged bed, bedroom, box spring, condo, Home, house, mattress, squeak by christao408. Bookmark the permalink. Lovely decor – You are much more diligent than I would have been. My first thought would have been to purchase ear plugs! hehe! Those pieces of ply wood are screaming to be cut in half long ways and hinged into 4 panels and then painted in a mod pattern and used as a screen to hide the storage area! Haha~what a great opportunity to showcase the room decor! Love the interior design! For a moment there, initially, I really thought you were going to introduce some new menu for having breakfast in bed. @murisopsis – Brilliant suggestion! I think we would need two more panels, actually, because the perspective in the picture makes the junk… er, storage area… look smaller than it is. As for the earplugs, they always fall out halfway through the night. My ear canals are too wide or something. =(@The_Eyes_Of_A_Painter – That would be a good next chapter! @Roadlesstaken – If I spent all my money on a new bed, I wouldn’t be able to afford to travel anywhere and have anything to write about on Xanga…@CurryPuffy – Thank you, glad you liked it. @awoolham – Thank you for your kind words. Actually, the condo has been covered in two photo shoots, one of which was for Elle Decoration magazine as a favor to our designer friend, who used the piece for publicity. Link here. I remember helping a friend moved once. I noticed his bedframe and headboard made a lot of scratches on the wall from repeated motion. ^ ^Your bedroom is lovely. I’m glad you folks figured out the mystery and didn’t need our help (hee hee…). You might want to try those rug mats that prevent rugs from shifting on a wooden floor to see if that might help the shifting mattress. Or maybe velcro straps? You have a beautiful bedroom. I am not sure I have any suggestions for you. I have trained myself not to read in bed. 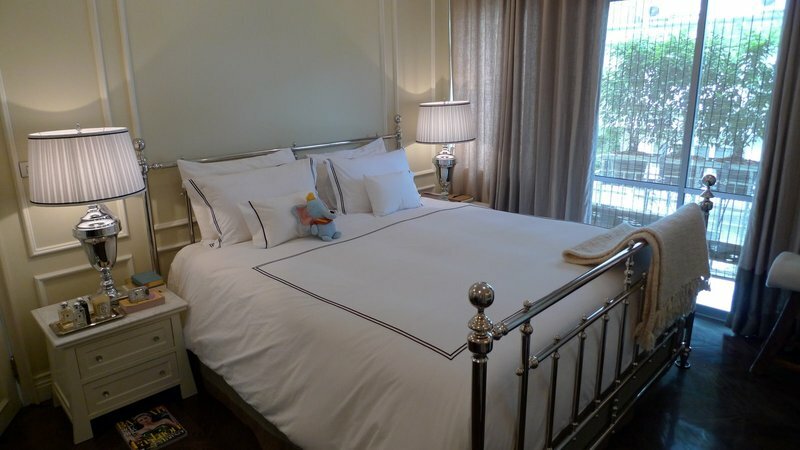 I have reserved the bed for sleeping. i am sorry but i couldn’t help but laugh it is just to funny but not for you i bet! I have a squeaky bed too but I guess I’m always to tired to notice. Anyway, thanks for letting us in the privacy of your bedroom. It looks really nice! Good job on the interior design. I don’t have any other suggestion that that given above. Beautiful bed room Chris. 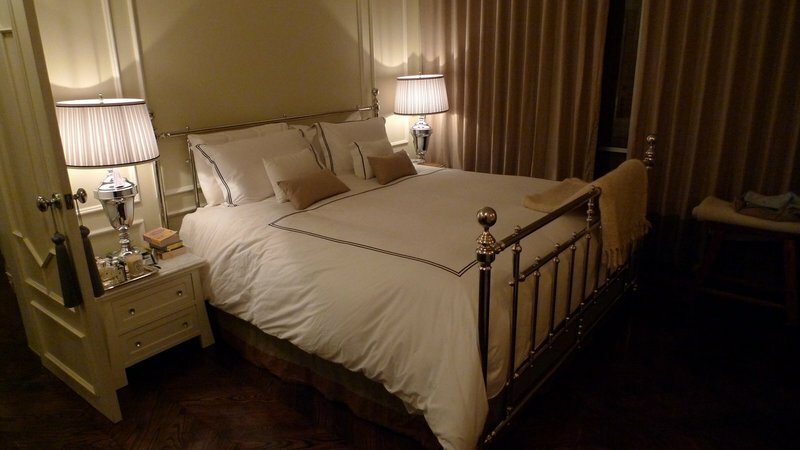 Many thanks to everyone for the compliments on the design of the bedroom. Wasn’t fishing for compliments but will certainly accept them. @Redlegsix – Well, considering that when the workers came to take measurements they showed up unannounced and were supposed to have made an appointment first, I never can quite tell what to expect! @oxyGENE_08 – @ZSA_MD – @ElusiveWords – Well, the good news is that the chirping bed frame seems to have been eliminated, so we’re happy with that. @grannykaren – Glad you enjoyed the story. I tried to write it in an entertaining manner. @Fatcat723 – While I generally believe in keeping the bedroom just for sleeping (no TV in there, for example), I do like to read a few pages before going to bed each night. Sometimes that’s the only time I can get during the day to read and I like to keep that habit alive. maybe try craigslist for getting rid of the boards? maybe you can use the boards to add some support to the frame so it doesn’t shift as much? i’m not sure i quite understand what the problem is, but i’m sure you could rig up something.as an engineer, i probably would have been determined to actually eliminate the squeaking rather than get box springs as a work-around (which means i’d still have a squeaky bed hahaha). @jace1982 – I’d imagine I could just put them by the side of the road and by morning someone will have collected them! @kunhuo42 – Solving the root problem was my desire but I was hampered by having to work through Tawn to communicate the details with the bed frame makers, who normally dont’ make bed frames and really don’t see any reason to continue to deal with the problem. @secade – Not a bad orientation to have! Hmmm…I suppose there are other moving parts as well unless all of the metal were welded together.You could anchor the frame to the wall so it doesn’t move much while you sit up and read?That or put some rubber feet on the legs.Losing storage space is probably just… that. @ElusiveWords – I broke two headboards already. @yang1815 – The frame is connected with hex screws and sense it is just essentially a box with no lid or bottom it has no lateral bracing. Not the end of the world, though, and I can read without leaning against the headboard. @christao408 – I was gonna suggest welding an X-brace but obviously not needed now!